America has Fourth of July, while Australia has Australia Day; Indonesia also has a day to equal those most celebrated national day, called Indonesia Independence Day or Hari Kemerdekaan Indonesia. Republic of Indonesia celebrates the Independence Day every August 17. To celebrate it, people are adorning every corner of the streets across the country with national colors—red and white—which resemble Indonesian flag. Idyllic nationalism vistas are everywhere, flags are waving, patriotic songs are echoing, and parades are marching on. In Bali, the celebration is peculiarly unprecedented compared with other regions in Indonesia. Involvement of foreign tourists, who are craving to experience this once-in-a-year cultural event, makes the celebration utterly different in the Island of Gods. These are things to do to celebrate Indonesia Independence Day in Bali in order to fully embrace the festivity. 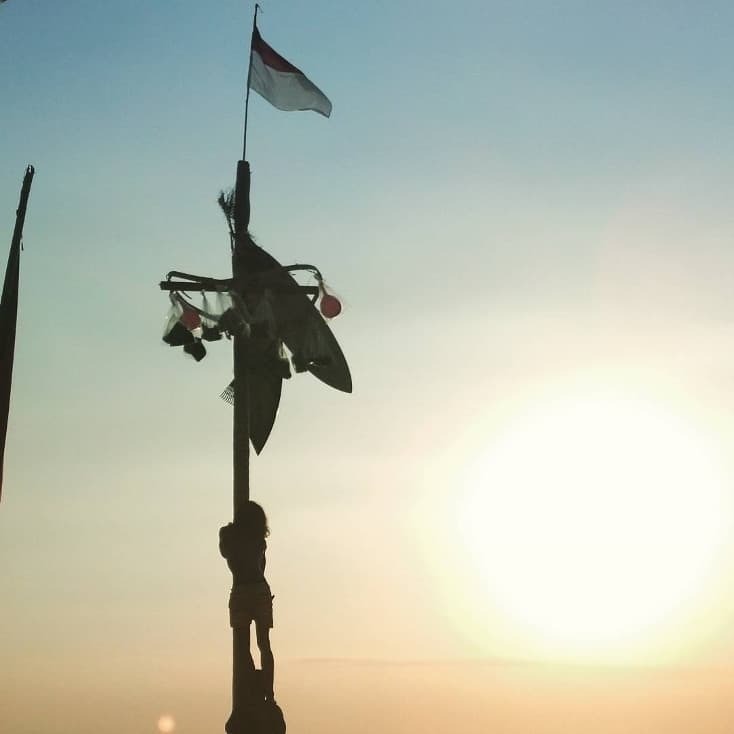 On August 17 morning, students and govt officials attend flag ceremony in which Indonesian red-and-white flag is raised high soaring the sky. Usually, there are some parade and defile of special team to raise the flag. An official flag raising ceremony is also held in State Palace in Jakarta, where Indonesian President would deliver Independence Day speech. This ceremony commemorates the moment when Indonesia first proclaimed the independence and is always screened on national television. Best places to partake in such events are schools and city square in Denpasar, in which most govt offices are located. Following the flag ceremonies, people usually gathers around some public spaces in their neighborhood for fun, friendly competitions. The competitions may vary, but mostly they are unique. From high-energized sack races to appetizing kerupuk (crackers) eating contest; from sarong-dressed soccer to the wild pillow fight; all those competitions offer tons of funny moments, especially for first-timers. While most competitions are restricted to particular age, some are open for public of various ages, origins, and genders. Best places for this are around traditional villages or local banjar. Bali’s most famous beaches—from Kuta to Seminyak—are also a great destination to participate in Independence Day competition. Panjat pinang is still the most interesting one. In panjat pinang contest, participants are challenged to climb lube-laced pinang (some kind of palm tree) trunk in which certain high-valued prizes are hung at top of it. Not only the pole is slippery and greasy, but it is also towering high, making it a challenging task. You can witness one or even participate in one if you happen to visit the nearby beaches. Indonesian finest historical and patriotic films are usually screened on local television channels during Independence Day. Biopic of Indonesia’s first president, Soekarno (in Hanung Bramantyo’s Soekarno), or other national heroes like Tjokroaminoto (Hanung Bramantyo’s Soekarno), Cut Nyak Dhien (Eros Djarot’s Tjoet Nja’ Dhien’) and others are also worth a shot. If you’re into more action, Yadi Sugandi’s Merdeka Trilogy is also a great choice to brush up your knowledge about Indonesian history with high-amped action sequences as bonus. While there are lots of celebration and festivity for one day, the best part of Independence Day is actually the food. Lots of restaurants or cafés promote Indonesian-themed cuisine on this day with finest Indonesian authentic dishes. From Rendang (CNN’s #1 of World’s 50 Most Delicious Foods list) —traditional marinated beef with spice paste; Nasi Goreng a.k.a. traditional flavored fried rice; to Tumpeng —a cone-shaped rice surrounded by assorted Indonesian dishes, there are myriads of choice to savor on the most celebrated day.